SettingsUpdation.Run : Exception occurred during the updation of run settings: System.FormatException: Error encountered while overriding test run parameters. Please check the test run parameteres provided. Error occurred while publishing test results : Skipping marking test run as complete as test run id 0 is invalid. Error: C:\TFSAgent4_work_tasks\VSTest_ef087383-ee5e-42c7-9a53-ab56c98420f9\2.143.8\Modules\DTAExecutionHost.exe failed with return code: 1 Vstest failed with error. Check logs for failures. There might be failed tests. 2019-04-04T13:52:40.2481161Z ##[warning]Unable to parse the override run parameters string: -SpecificDatabaseConnectionName=XXX_TestCI -SpecificDatabaseConnectionIPAddress=10.0.0.119 2019-04-04T13:52:40.2941407Z ##[error]SettingsUpdation.Run : Exception occurred during the updation of run settings: System.FormatException: Error encountered while overriding test run parameters. Please check the test run parameteres provided. I'm not sure what's causing this, it just seems like a bug to me, is there anything else I need to set to make these two options work together correctly? My understanding is that other users have experienced this issue too(per deleted answer), I never tested the previous version of TFS so I don't know if it's specific to Azure DevOps or covers other versions of TFS. I also don't know if this is an issue in Azure's hosted version of DevOps, I'd be curious if that was affected too? It could be a parameter in the test step, maybe the version of Visual Studio installed on the build agent server, or something else covering the way I run my tests, I've seen allot of things that can cause the build agents to go haywire in the past, I'll continue trying different variations to see if I can determine if any of these are the root cause. Not the answer you're looking for? 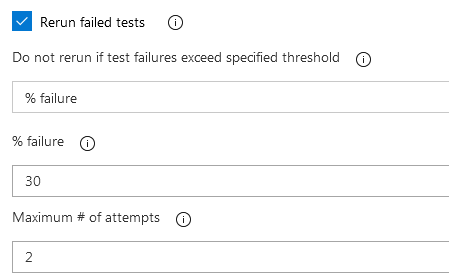 Browse other questions tagged azure testing azure-devops release azure-pipelines-release-pipeline or ask your own question. How to get parameter values from a test case on azure devops (former vsts) in C# tests?